Conspiracy theorists are often berated for warning about the coming “New World Order.” But the global government is not some scheme cooked up by Ron Paul nut jobs. On the contrary, the concept of establishing a “new world order” has been referenced by the likes of George Bush Sr., Henry Kissinger and Barack Obama. Really, we already have a partial “new world order” — better termed the “Anglo-American Empire.” Basically, the Anglo-American Empire describes the already existing global power structure seated in Western Europe and the United States. Policy-making think tanks such as the Council on Foreign Relations and The Trilateral Commission already exercise excessive global sway. And institutions such as the World Bank, International Monetary Fund, United Nations and International Criminals Court already function/govern at a global level. “State sovereignty must be altered in globalized era. Our notion of sovereignty must therefore be conditional, even contractual, rather than absolute. If a state fails to live up to its side of the bargain by sponsoring terrorism, either transferring or using weapons of mass destruction, or conducting genocide, then it forfeits the normal benefits of sovereignty and opens itself up to attack, removal or occupation. Globalization thus implies that sovereignty is not only becoming weaker in reality, but that it needs to become weaker. But is trading national governance for global governance a wise idea? To be sure, most nations’ governments are corrupt and many oppress their people in one form or another. But would a more centralized, powerful form of government guarantee the “liberty and justice for all”? So I just completed the quiz, “What Kind of Libertarian Are You?” at QuizFarm.com. My results were both surprising and enlightening — at least to me. I scored 92 percent “left-libertarian.” According to the quiz, left-libertarians are “more associated with the anti-authoritarian left” and are “more critical of conservatism and corporatism.” Evidently, recent bailouts have put a bad taste in my mouth toward corporate welfare. My second highest score was 75 percent “minarchist.” Curious as to what the term meant, I decided to do a little research. 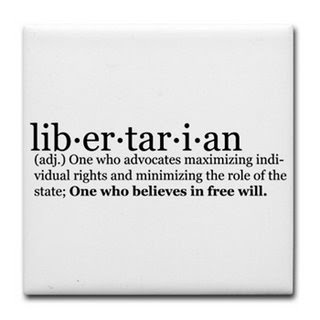 Minarchy, or “minimal statism” is a political philosophy that advocates a system where government acts only to protect the life, liberty or property of an individual. Basically, it sees government as a necessary evil. Minarchy comes closest to describing my political leanings. It is in contrast to anarchy, which argues against any form of a compulsory state. There has been much to do lately about so-called “Miranda rights.” Specifically, when they should be read and who should be read them. The truth is, there are no such thing as Miranda rights. There is the Miranda warning as established by the Supreme Court in Miranda v. Arizona. Miranda also provides a “public safety” exception where officers may question a suspect without first obtaining a waiver if they believe a person to have “information that could help save a life, prevent serious injury, or neutralize a substantial threat to property.” This exception was recently employed by officers interrogating New York car bomber, Faisal Shahzad. “Today, then, there can be no doubt that the Fifth Amendment privilege is available outside of criminal court proceedings and serves to protect persons in all settings in which their freedom of action is curtailed in any significant way from being compelled to incriminate themselves. So when we’re talking about reading terror suspects their “rights,” it’s important to remember that these aren’t actually rights, but warnings to protect officers and, most importantly, evidence obtained. Miranda is merely a safeguard put in place to ensure the rule of law and promote justice. Who says Congress is can’t come together for the common good? Yesterday, in a rare display of bipartisanship, Senators Joseph Lieberman (I-CT) and Scott Brown (R-MA) and Congressmen Jason Altmire (D-PA) and Charlie Dent (R-PA) introduced the Terrorist Expatriation Act. It should be renamed the American Citizen Expatriation Act. The bill aims to strip Americans of their citizenship if suspected of affiliating with a foreign terrorist organization and are apprehended abroad. It would amend the 1940s bill, 8 USC 1481, which gives the federal government the power to strip Americans of their citizenship if they choose to fight for a foreign military force. So far, the White House appears to not support the bill. Senator Joe Lieberman, the bill’s main architect, wants to expand 8 USC 1481. “Because it just seems to me if you basically declare yourself to be an enemy of the United States you’re no longer entitled to the rights of citizenship,” he said. While civil liberties groups are rightfully crying “unconstitutional” and pointing to the bill’s disregard for due process, Lieberman’s remarks reveal a more serious, and dangerous, assumption: That the rights of Americans are dependent on their status as citizens and therefore, may be taken away. But the U.S. Constitution wasn’t meant to protect “temporary privileges” — it was meant to recognize already existing human rights. Having these rights declared in the first ten amendments of a document doesn’t make them valid. Actually, the Bill of Rights doesn’t even bother differentiating between citizens and non-citizens. Like the freedoms of expression and religious conviction, justice is not some privilege to be revoked. It is an inherent right — one that suspected terrorists own. Belgium is looking to be the first European country to ban the niqab — a traditional head scarf-veil combo worn by Muslim women that covers the entire face except for the eyes. Lawmakers say the niqab hides the identity of women and creates a barrier between them and society. The move toward banning traditional Muslim veils and headscarves is a trend spreading across Europe. In 2004, France cited the principle of “secularism” as reason to outlaw headscarves in its schools. The argument that such laws are necessary is a weak one. The argument that such laws promote “secularism” and “tolerance” is downright ridiculous. How can a law promote tolerance by being intolerant of individuals’ beliefs and choices? Forcing Muslim women to remove the niqab is like forcing orthodox Jewish men to shave their beards. Both are worn because of deep, religious convictions. To be sure, some Muslim women have no choice and are forced to cover themselves. As a feminist woman, I could not be more opposed to the wearing of garments such as the hijab, niqab and burka. To me, they are symbols of religious and patriarchal oppression. But my convictions do not give me the right to force Muslim women, or men, to forsake theirs. It’s no surprise Attorney General Eric Holder and the Obama administration are caving to pressure by leading Republicans to try terror suspects in military tribunals. What is surprising is the lack of outrage from the American people who actually appear in favor of such kangaroo courts. Probably because most Americans are under the delusion that the U.S. Constitution, Bill of Rights and Miranda Warning only apply to U.S. citizens. They need to do their homework. The entire case for military tribunals rests on the assumption that A) terrorists are not American citizens and B) they are therefore not entitled to the “rights of the accused.” But the notion that only citizens are privilege to the first 10 amendments of the U.S. Constitution is completely unfounded. So the 14th amendment prohibits states from abridging the privileges or immunities of citizens while at the same time prohibiting them from depriving any person of due process and equal protection under the law. While many Republicans and even Democrats are crying foul over the Obama administrations’ proposal to read terror suspects the Miranda Warning, it appears the Bush administration has already done so. According to a February 2008 article by The Washington Post, FBI agents were reading suspected terrorists their rights long before Obama stepped foot in the Oval Office. “The men were read rights similar to a standard U.S. Miranda warning, and officials designed the program to get to the information the CIA already had gleaned by using waterboarding, which simulates drowning, and other techniques such as sleep deprivation, forced standing and the use of extreme temperatures. They argument that the Miranda Warning applies only to U.S. citizens is equally an uneducated one. The fact is all criminal suspects, as ruled by the U.S. Supreme Court in Miranda vs. Arizona, are entitled to be informed of their rights. This means all persons detained, including immigrants and foreigners, are read their Miranda rights. The obvious purpose of Miranda is to assure information obtained is admissible in a court of law as required by the Bill of Rights. 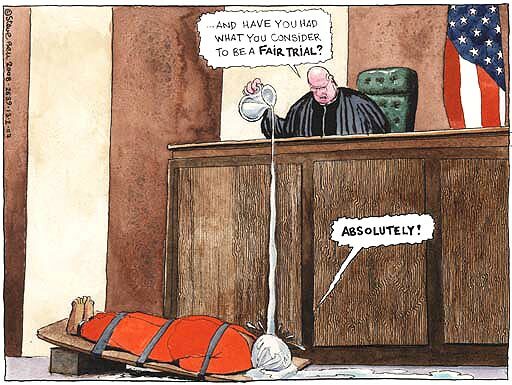 Miranda aside, the underlying assumption driving the motives of those advocating military tribunals is that the crime of terrorism is so horrible precedent and law do not apply and/or that terror suspects are already guilty. For example, it’s not uncommon to hear conservative pundits referring to Guantanamo Bay detainees as terrorists rather than suspected terrorists. It’s as if they’ve already made up their minds — no evidence or trial necessary. As Americans, we must remember why we have protections in place such as those in the U.S. Constitution and Bill of Rights. The rights enumerated in these documents were not bestowed on us by our enlightened and all-wise founders. They could not be given, as they already belonged to us by the mere fact of our humanity. Just as each and every American has the inherent right to justice, so to do such detested figures as Khalid Sheikh Mohammed and Osama bin Laden. Is America truly a democracy? Professor, philosopher and political activist Noam Chomsky doesn’t think so. He believes power resides in the hands of an elite few rather than in the people. According to him, America “Is not a democratic society and it is not intended to be.” Instead, Chomsky describes America as a polyarchy, a word borrowed from Yale professor Robert Dahl who coined the term his 1956 book, A Preface to Democratic Theory. Basically, a polyarchy is a system of government where power is vested in three or more persons. The masses are “fragmented and distracted” and allowed to participate in the political process on occasion. According to Chomsky, such a system has been established in America since the constitutional convention in 1787. Of course, we’re all familiar with Madison’s famous words, “If men were angels, no government would be necessary.” But such a mistrusting view of the governed still dominates the philosophies of both the left and right. Indeed, the whole framework must be changed. With the passing of the healthcare legislation, Americans can focus their attention on the much more controversial issue of immigration reform. While the healthcare debate drew ideological lines between perceived socialists and capitalists, immigration promises to create all-new divisions — divisions dependent on skin color and nationality. My hope is for a civil, pragmatic approach to immigration reform. Instead, I fear a debate purposely fueled by emotions linked to class, race and nationality. I do not look forward to seeing more frightening outbursts like this one by Fox News’ Bill O’Reilly. As Americans attempt to confront the presence of millions of undocumented persons, let us remember the issue at hand is a human one. We are dealing with people, not statistics. And let us consider ourselves fortunate to have been born with the “right” of American citizenship. I haven’t studied John Stuart Mill since high school and vaguely recall something about utilitarianism. But the other day a friend of mine gave me a copy of John Stuart Mill’s On Liberty. Now I’ve only delved into the first chapter so I’m not exactly well-versed on Mill’s philosophy. However, I was introduced to his concept of “social tyranny.” Basically, social tyranny is the collective “voice” of the people drowning out that of the individual. It is majority rule or rule by the loudest. Social tyranny is the reason I fear socialism. It is the reason I fear conservatism. Both ideologies mean well. They see problems within a society and try to remedy them through the “collective voice of the people” otherwise known as government and law. But too often, the good-intentioned ideologues forget about the individual. Too busy envisioning the society they consider fair and just, they lose sight of liberty and inherent rights. Such is the case with legislation that attempts to define marriage, affirmative action and drug laws. Is there a balance to be reached between individual rights and the collective good? I’m not sure. Perhaps Mill will enlighten me.